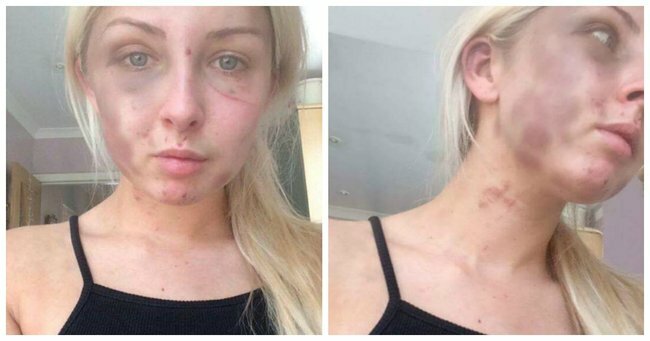 Teenager shares photos of domestic abuse injuries. Don't look away: Kelsie Skillen wants you to look at her bruises for an important reason. Trigger warning: This post contains an account of domestic abuse that may be triggering for some readers. A teenage girl who was beaten for four hours by her ex-boyfriend after she refused to get him cigarettes has shared photos of her injuries following the brutal attack. Kelsie Skillen, 18, was left bruised, swollen and now has a scar from the incident in which 19-year-old James McCourt assaulted her after taking her phone and locking her inside his apartment. “You’re going to have a bruised face tomorrow so I better do it right,” he reportedly told her, before spitting in her face and pouring water over her. McCourt admitted to assaulting Skillen "on various occasions" between May 1 and 31 this year, including bursting her nose open. He was sentenced to 21 months in detention and will be supervised for 8 months following his release. "I’m happy he has been sent away and can’t get to me, I’m so glad," the hairdresser and make-up artist told reporters outside the Glasgow Sheriff&apos;s Court yesterday. "During the incident I kept saying &apos;Is it worth going to jail?&apos; and he said &apos;I don’t care if I go to jail as long as you’re dead.&apos;"
"I remember thinking, he is trying to kill me. He is dangerous." The particularly brutal attack that happened when the couple returned home from a night out without McCourt&apos;s jacket, which had his cigarettes in the pocket. "He said it was my fault, I had left his jacket, then he just flipped and grabbed me and attacked me." Skillen drifted in and out of consciousness as McCourt bit her, put his knees on her chest and punched her repeatedly, all the while verbally abusing her. "He had his knees oh my chest so I couldn’t get up and was punching me," she said. Eventually, when he left the room to go to the toilet, she managed to find her iPad and contacted her mum who brought the police to her rescue. "My iPad only had two per cent battery so I had to be quick, I was panicking and managed to get in touch with my mum. "When she turned up I quickly ran to the buzzer – then he ran away." Skillen had stopped screaming for help when she realised it only provoked him further. 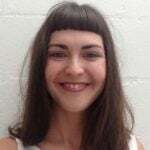 "Eventually I realised the more I kept screaming he more he retaliated and attacked me, eventually I got to the point I stopped and he wasn’t getting the reaction he wanted," she said. She accompanied the photos of her injuries on Facebook with a short paragraph explaining her choice to share them. "I&apos;m purely just putting this out there so everyone knows what he&apos;s like," she said. "I would never be able to forgive myself if I didn&apos;t tell people about this and another poor girl ended up in my situation." A defence advocate fro McCourt said he is suffering from post traumatic stress disorder and is "ashamed" of his conduct.